Oh, afternoon tea! One of my favorite things! 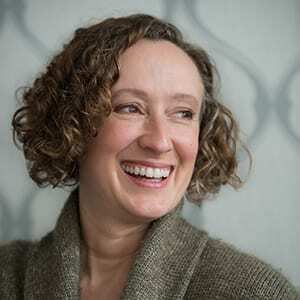 From formal, multi-course affairs, to casual cream teas – I love them all! But for me, there is something extra special about a simple cream tea. It offers a luxurious pause from the afternoon, without being overly decadent or taking hours on end. It’s perfect for sharing with a friend, or just as perfect for escaping to a quiet corner and enjoying with a good book. 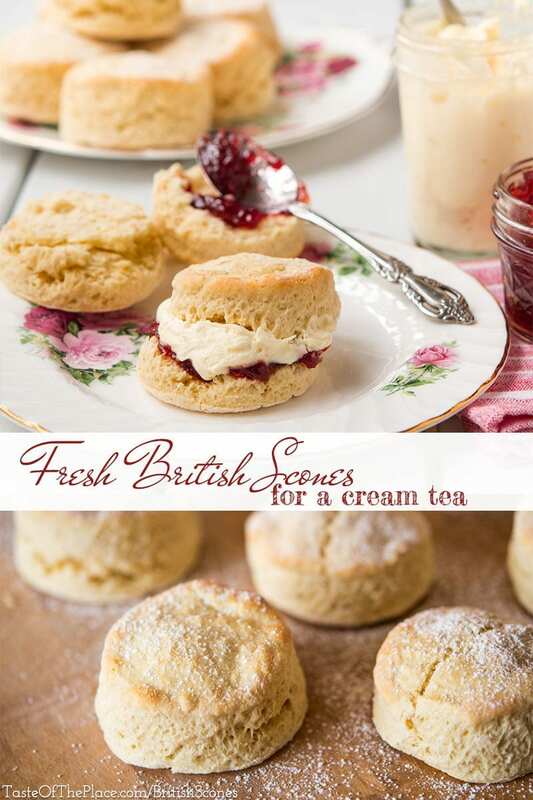 In case you don’t know, cream tea is simply tea served with scones, jam, and clotted cream. Perfection! We here in the US are woefully undereducated when it comes to tea. High tea, afternoon tea, cream tea, Lipton tea – it all sounds the same, right?! Well, not the Lipton part, anyway! 😉 Until I began researching tea in the last few years, I couldn’t have told you the difference between afternoon tea, high tea, cream tea, or any of the other types of traditional teas that can be found throughout the UK. Afternoon tea is a fancy and elegant respite from the afternoon, complete with fine china, delicate sandwiches, and dainty pastries and cakes. It’s sometimes called low tea, because it is often enjoyed while relaxing in low, comfortable chairs, sitting around low tables, such as a coffee table, like you might find in an aristocratic drawing room. By the way, if you would like to experience a divine afternoon tea for yourself, and you happen to live in the Pacific Northwest, I put together a list of some of the best places in the area to enjoy a festive, holiday afternoon tea at TasteOfThePlace.com/Afternoon-tea-PNW. High tea, on the other hand, is more of a hearty meal with savory dishes, traditionally taken by workers at the end of the work day. In contrast to the low, afternoon tea, high tea was enjoyed at a higher dining room table, or, I would like to image, a pub table. Cream tea is essentially a simplified afternoon tea, with freshly baked British style scones (like the recipe below), jam (usually strawberry), and clotted cream (clotted cream is a heavenly bit of luxuriousness that tastes like the divine cross between butter and whipped cream – you can read all about it at TasteOfThePlace.com/ClottedCream). Both cream tea and clotted cream originated in Cornwall and Devon, in western England. The two – Cornwall and Devon, that is – are greatly divided on the matter. Where did the cream tea originate? Who really invented clotted cream? 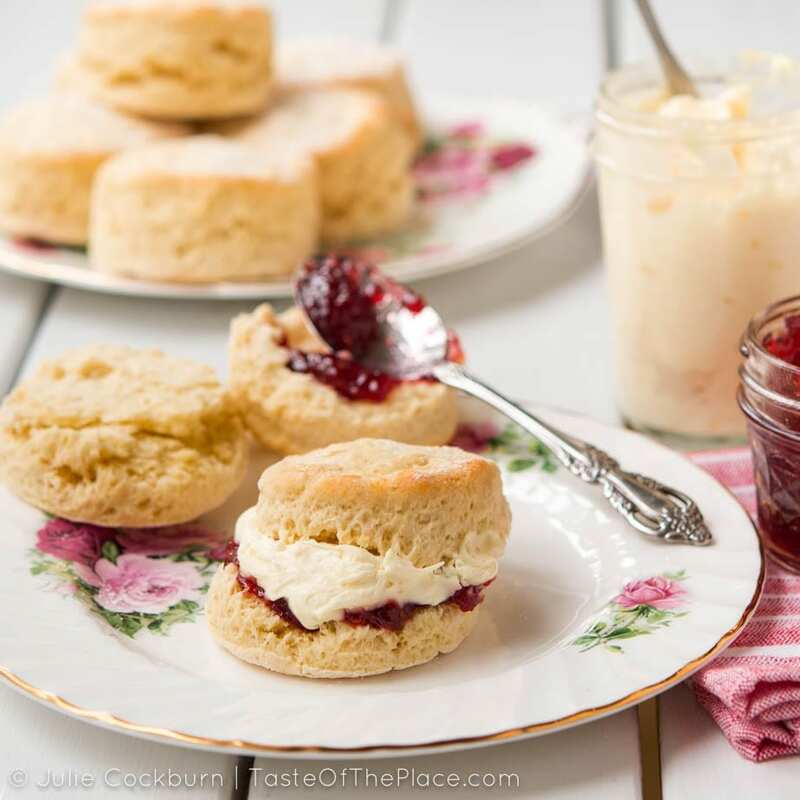 Which should go first on the scone – cream or jam? Serious topics for debate, to be sure! Debates aside, I think we can all agree that cream tea is delicious! 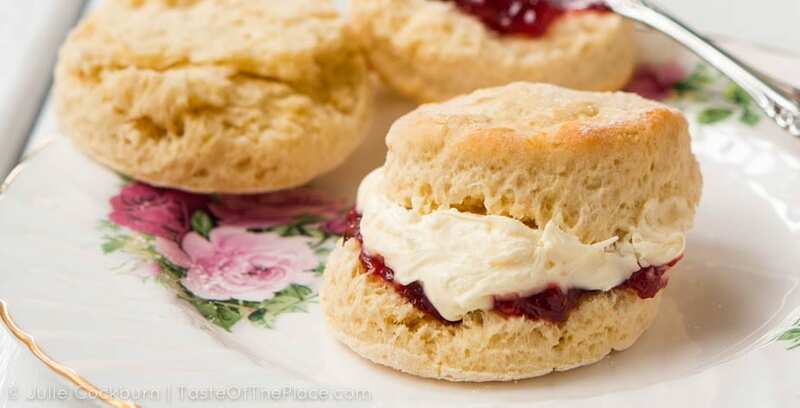 This recipe for scones comes to us from my friend, Debbie Thorpe, from Cornwall. She shared her tasty recipe with me for the Great Britain chapter of my new Taste Of The Place cookbook. 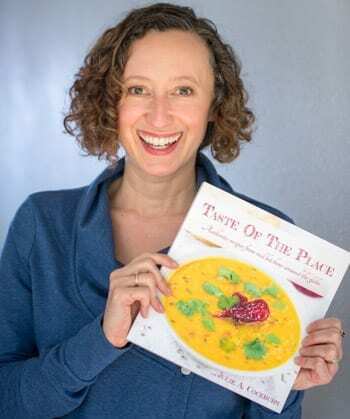 If you want to learn more about the cookbook, head over to Tasteoftheplace.com/buythecookbook. These are not the heavy, triangular, sugar-bomb bricks that most people in the US think of when ordering a scone at their local coffee shop. No, these are light and fluffy, with just a touch of sweetness. They’re somewhat similar in look and texture to a southern style biscuit and are perfect for slathering with clotted cream and jam. The recipe calls for self-rising flour. I like to use the King Arthur brand. I’ve also played around with making my own self-rising flour, but tend to get inconsistent results. If you want to give making your own a go – the formula is 1 1/2 teaspoons baking powder + 1/4 teaspoon salt to each 1 cup of all-purpose flour. Plan to make your scones just before serving. Scones are divine hot out of the oven and will keep well for several hours – but not much longer. Second-day scones are OK, but nothing like the delicious treats they are when first made. Debbie, the recipe contributor, suggests that you can mix this recipe up by adding a handful of golden raisins, dried berries, or cranberries. Or for a savory scone, replace the sugar with 1 1/2 to 2 ounces of grated cheese. Grab my clotted cream recipe at TasteOfthePlace.com/ClottedCream. And if you do make clotted cream, you could use the leftover liquid-y bits as part of the milk in the scone recipe. How perfect is that? Oh, and Debbie’s opinion on the great jam or clotted cream first debate? The Cornish way, of course! Jam first, and then cream! Sift the self-rising flour and baking powder into a large bowl. Use your fingers to rub in the softened butter, until it reaches the consistency of fine breadcrumbs. Stir in the sugar. In a 2 cup or larger measuring jug, beat the eggs together. Add enough whole milk to reach 1½ cups. Whisk to incorporate. Set aside 1½ tablespoons of the egg and milk mixture for brushing on the scones before baking. Add the remaining egg and milk mixture to the dry ingredients, and using your hands, very gently mix until just incorporated. The mixture will be slightly sticky. Turn the dough out onto a well floured work surface. Dust your hands and the surface of the scone mixture with flour, and using your hands, very gently flatten the dough into a ½ to 1 inch thick disk. Don’t use a rolling pin to flatten the dough, as that can cause the scones to be too flat and dense. Cut out circles with a 2½ to 3 inch biscuit cutter. Very gently work any extra bits back into a ½ to 1 inch thick disk, and cut additional circles with the biscuit cutter. Place the scones about 1 inch apart on a parchment paper lined baking sheet, and brush with the reserved egg and milk mixture. Bake for 10 to 15 minutes, or until lightly browned. Be sure not to open the oven door during the first 10 minutes, as the loss of heat can cause the delicate scones to not rise properly. Remove from the oven, and allow to cool slightly. Dust with powdered sugar, and serve with clotted cream and strawberry jam. This recipe for scones comes to us from Cornwall. My friend, Debbie Thorpe, shared her tasty recipe with me for my upcoming cookbook. These are not the heavy, triangular, sugar-bomb bricks that most people in the US think of when ordering a scone at their local coffee shop. No, these are light and fluffy, with just a touch of sweetness. 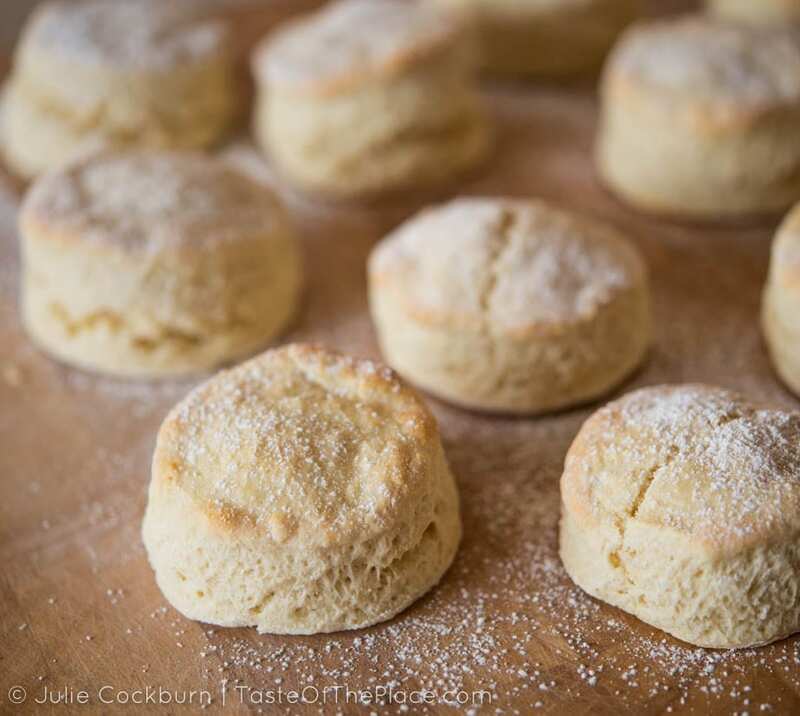 They're somewhat similar in look and texture to a southern style biscuit, and are perfect for slathering with clotted cream and jam. The recipe calls for self-rising flour. I like to use the King Arthur brand. I've also played around with making my own self-rising flour, but tend to get inconsistent results. If you want to give making your own a go - the formula is 1½ teaspoons baking powder + ¼ teaspoon salt to each 1 cup of all-purpose flour. Plan to make your scones just before serving. Scones are divine hot out of the oven, and will keep well for several hours - but not much longer. Second day scones are OK, but nothing like the delicious treats they are when first made. Debbie, the recipe contributor, suggests that you can mix this recipe up by adding a handful of golden raisins, dried berries, or cranberries. Or for a savory scone, replace the sugar with 1½ to 2 ounces of grated cheese. Note: I’m linking to the King Arthur self-rising flour (my favorite brand) on Amazon for your convenience, although the price on Amazon is ridiculously expensive at the moment. Hop over and check it out, and if it is more than $6.00 for a 5-pound bag, I would recommend looking for it in your local grocery. “Food has always played a major part in my life. From a young age I was encouraged to join in, sow seeds, fish and forage. That nostalgia is now being passed down to my own children. I qualified as a chef in my twenties and still love every moment and food memory created. As a mother, I am proud to be able to share this with my family, and as a Jamie Oliver Food Revolution Super Ambassador, I am proud to share this with my community. Tea etiquette – just for fun! During my research, I came across this lovely video all about proper tea etiquette from The English Cream Tea Company. I thought you all might enjoy seeing it, too. Give it a watch, and then remember to keep those pinkies in line the next time you’re indulging in a cup of tea! Of course I just loved this post. It makes me want to have a tea party right away! A tea party will never be the same again without your wonderful clotted cream!